I love the picture, the title, and the whole story, everything is so sweet. 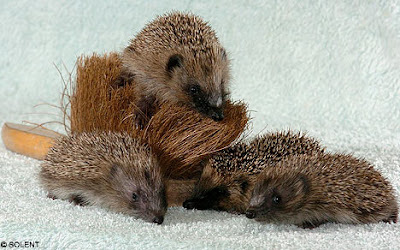 Four tiny orpahned hedgehogs are snuggling up to the bristles of a cleaning brush - because they think it's their mother. The four inch long creatures are being hand-reared by staff at the New Forest Otter, Owl and Wildlife Park in Ashurst, Hants.